Amatrol’s PLC Safety Troubleshooting Learning System – Siemens ET200PRO (890-ET200SF) teaches general PLC programming, operation, and troubleshooting in Safety PLC applications. Safety PLCs are growing in popularity, because they provide for the safe operation of a machine or process and offer improved fault detection and diagnostics in automated systems, enabling production to resume quickly following a safety-related interruption. Safety PLCs are used regularly in applications involving robots or wherever emergency stops are standard. The Safety PLC training system includes industrial components, such as a Siemens ET200PRO Safety PLC, fail-safe discrete I/O module, e-stop assembly, Siemens managed EtherNet switch, and much more! Learners will use these components to study the basics of PLC components, operation, and applications before moving on to more advanced topics, like application editing, programming, timer instructions, safety program configuration, and safety application blocks. Only Amatrol Provides Vital Hands-On Training Using Safety PLCs! The Safety PLC training system covers the Safety PLC, its applications within industries, and various hands-on skills to prepare learners for job opportunities in manufacturing. Some of these skills include: identifying Siemens ET200PRO safety hardware; configuring an ET200PRO IM 54-8FX controller in a safety project; using safety I/O in a safety project; adding error OBs to an ET200PRO project; monitoring multiple instances of the F-stop function block; and using F-I/O datablock parameters to passivate F-I/O modules. Growing in popularity, safety automation systems are built for error-detection in automated processes, which minimizes danger to operators and components without restricting industrial production any more than necessary to achieve the specified level of safety. The Safety PLC runs two programs simultaneously: one program written to execute the procedure and the other, a safety program, built for early error detection. Amatrol products provide an unmatched learning experience, because our learning systems are built from real-world industrial components. This approach allows learners to practice and build skills on components they’ll actually use on job sites. 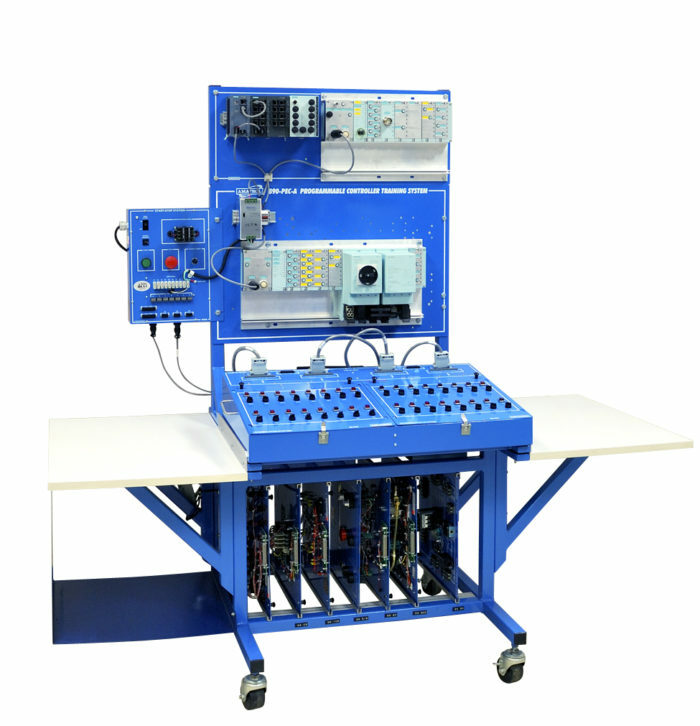 The Safety PLC training system includes a Siemens ET200PRO Safety PLC, 8-point input module, 8-point output module, 4-point output module, fail-safe discrete I/O module, PC programming interface, E-Stop assembly, EtherNet switch, and more. The Siemens ET200PRO includes comprehensive self-tests and self-diagnostics to check the fail-safe of the controller by running two programs simultaneously: a standard program written in ladder logic and a safety program written in either F-LAD or F-FBD. Along with specialized Safety PLC skills and topics, the Safety PLC training system curriculum also thoroughly covers PLC knowledge necessary for job-ready skills. Beginning with basic components and operations, learners will study topic areas including: PLC programming, motor control, timer and counter instructions, troubleshooting, event sequencing, and application development. Learners will use this knowledge to practice hands-on skills, such as: entering a basic controller project using the SIMATIC manager; designing a PLC program to jog a motor; troubleshooting a fault using Error OBs; and designing a reciprocating actuator PLC program. In addition to the vital skills and topics included with the base learning system, the Safety PLC training system can be expanded with several optional products that can extend the teaching potential for this growing industrial area. These additional products include: Stacklight (89-SLET200), HMI (89-HMIET200), RFID (89-RFET200), Profinet Pneumatics (89-EPN1), and Profinet (89-PNET200).